Campaign takes direct action to end war on the poor across state and U.S.
Young workers from #D15 constituted a large part of the march, drumming, chanting and dancing through the streets of Lansing. 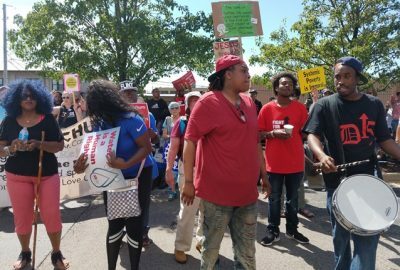 LANSING – Well over 700 people flooded the streets of Michigan’s capital June 11, as part of the national Poor Peoples Campaign of direct action against the super-rich. They came from across Michigan, including two busloads from Detroit and another from Flint. They included youth from #D15 demanding a $15/hr. 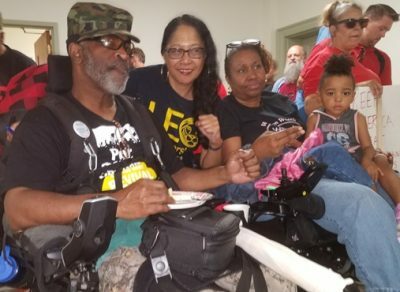 wage for fast food workers, the disabled in wheelchairs, and AT&T union workers likely on the brink of a national strike. Joining them were Detroit city retirees demanding the return of millions in pension and health care funds, Flint residents and others demanding the restoration of state-funded bottled water supplies and an end to water shut-offs, and Detroit homeowners demanding that federal Hardest Hit funds to be used to keep occupants in their homes, stop tax foreclosure auctions and shut down the Mike Duggan/Dan Gilbert scandal-ridden Blight Removal Task Force. 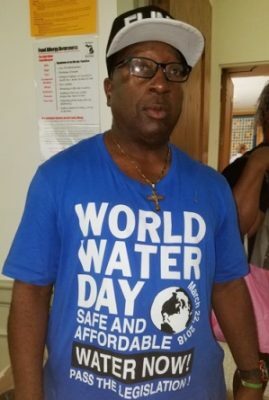 Flint resident demanding funding for water crisis. They were angry and motivated by the announcement of state, city and county budget surpluses resulting from severe cutbacks in human services to pay off massive government debts to the banks. Michigan has a $575 million revenue surplus this year, which it has refused to spend to remedy the Flint water crisis. The City of Detroit announced an unprecedented $63 million surplus resulting from drastic cuts to city retirees’ pensions and benefits, and the dumping of Detroit’s major assets during the false bankruptcy proceedings in 2014. Detroit’s debt to the banks increased 300 percent over its pre-bankruptcy level. 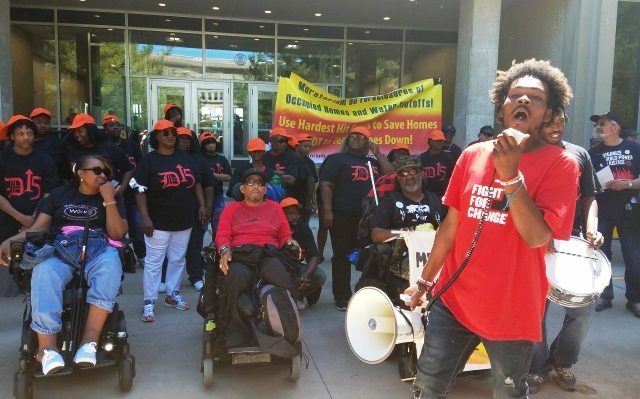 At the conclusion of a 1.7 mile march and two rallies that targeted the State Treasury Building and the headquarters of MSHDA (Michigan State Housing Development Authority), hundreds from the march, with youth from #D15 in the front lines, sat down to block the entrance to the MSHDA HQ. The rally and sitdown outside MSHDA lasted for nearly an hour, as troopers lined up to guard the entrance, making it appear that no access to MSHDA officials contacted earlier for a meeting would be allowed. Protesters mass outside the State Treasury Building in Lansing April 11, 2018. But finally, amid cheers from the crowd, Yvonne Jones, leader of the Detroit Active and Retired Employee Association (DAREA), Mike Shane and Jerry Goldberg of Moratorium Now!, and Abiyomi Azikiwe of the Michigan Emergency Committee on War and Injustice were ushered through the line of troopers into the building for a scheduled meeting at 4:15 p.m. Meanwhile, however, troopers announced that all those remaining outside the building would be arrested if they did not leave. Thirteen protesters were arrested, but they were released after receiving citations, in time to return to Detroit and Flint on the buses. The city would then turn the homes over to the occupants, including, owners, renters, or others who have just occupied the premises for shelter, based on affordability guidelines. A program to ensure that the homes are tax assessed at their proper value instead of the exorbitant rates that have prevailed. A program to ensure property tax exemptions are applied to eligible families. A zero interest home repair revolving loan fund. The payment of delinquent water bills for families whose water bills exceed the 2.5 % income guidelines recommended by the EPA, since water shut-offs effectively represent evictions. Aurora Harris (center) joins Baxter Jones and another representative of the disabled caucus during initial rally at church. Jones, a long-time DPS teacher, lost his home after an accident that left him unable to work. This time, Shane said, the MSHDA officials flat out refused to enact the demands. “While we have carefully reviewed and contemplated your written request, we believe that the programs currently in place will aid homeowners with tax foreclosures and keep many households in their homes,” Townley said in a written response. 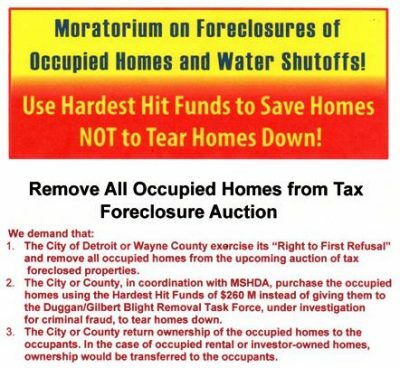 See MSHDA’s complete response at http://voiceofdetroit.net/wp-content/uploads/MSHDA-to-Moratorium-Now-Coalition-May-2018-response.pdf. Numerous speakers brought up other multiple issues faced by poor and working people in Michigan and across the U.S. during an initial rally at the First Presbyterian Church. 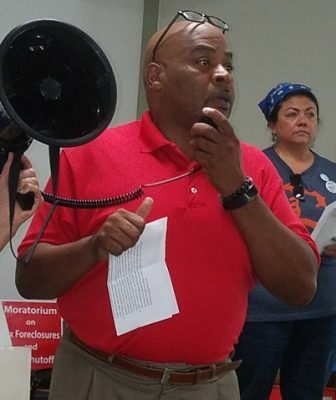 Shawn Kirkland, a staffer from the Communications Workers of America, said their union has been in negotiations with AT&T for the last three and a half months. The union currently is on the verge of a national strike. A representative of the Detroit People’s Platform called for massive public transit funding, one of the group’s many platform planks. Dorothea Brown connected #D15’s demands for a $15/hr. wage to her transit problems. Helen Moore and Teresa Kelly addressed the plight of schools in Detroit and Highland Park. Moore is featured in the video below. This was the fourth and last “Moral Monday” action in Lansing. Organizers said it was by far the largest, indicating the campaign is growing as the grass roots begin to stem the tide of the all-out assault on working and poor people driven by the corporations and the banks, using Donald Trump and sell-out Democratic politicians as their puppets. 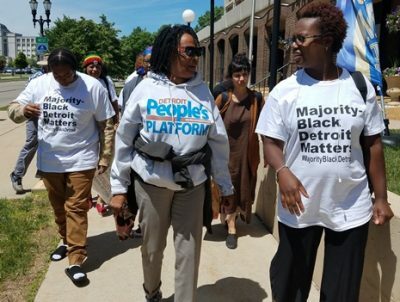 Members of the Detroit Peoples’ Platform call for justice for majority-Black Detroit. The next action is set for Monday, June 18, beginning in the Central United Methodist Church at Woodward and Adams, in the heart of Detroit’s downtown which has been thoroughly gentrified for the benefit of the white and wealthy, led by billionaire Dan Gilbert. Along with Moratorium Now, sponsors of Monday’s action included the Michigan Welfare Rights Organization, Detroit Eviction Defense, the Detroit People’s Platform, the Detroit Active and Retired Employee Association, the People’s Water Board, Detroiters Resisting Emergency Management, the United Food and Commercial Workers, and the Communications Workers of America (CWA), among others. This entry was posted in Uncategorized and tagged D15. Bookmark the permalink.